Michelle A. Hernandez, shareholder, recently participated in the 2015 Youth Entrepreneur Speakers Series at Atrisco Heritage Academy High School. 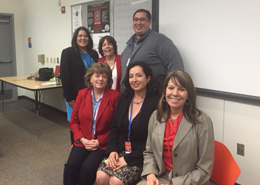 She shared the podium with speakers including Janice Lucero of MVD Express and Jennifer Riordon of Wells Fargo Bank. Some 70 students, selected from high schools around the metro Albuquerque area, learned about the personal journeys of leaders throughout the community. Beyond the in-classroom Youth Entrepreneurship curriculum, the Youth Entrepreneurship Speakers Series provides a way for corporate, small business and community representatives to serve as role models and share their real-life experiences. Through a Bernalillo County-funded joint grant proposal, the Albuquerque Hispano Chamber of Commerce, Atrisco Heritage Foundation/Companies, Central New Mexico Community College (CNM), New Mexico Federal Credit Union, and Southwest Valley Small Business Development Center are collaborating in their efforts to support students’ interest in entrepreneurship.